Why is Spinzaku a meme? An internet meme is a piece of content which is naturally unremarkable by itself. What makes an internet meme remarkable, however, is not the content itself. Memes are the result of cultural propagation. They spread from user to user, eventually transforming a simple image or catchphrase into an immense phenomenon. Memes can take on many forms, be it a simple text quote, an image, or a short video clip. The above image is one of thousands of examples symbolizing this phenomenon, albeit a rather old and overused one–the Spinzaku. The Spinzaku is named after Suzaku Kururugi, one of the main characters of the Japanese mecha anime series Code Geass. 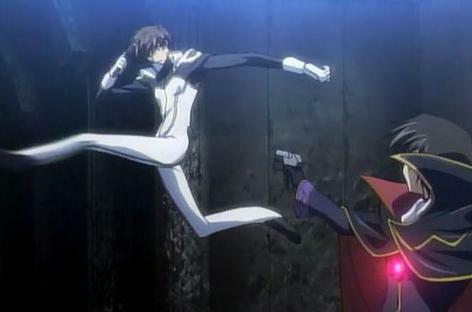 (Code Geass R2 if you’re inclined) This sequence takes place during one of the more memorable scenes in the beginning of R2, a flashback which depicts Suzaku’s capture of his best friend, Lelouch Lamperouge, (the main protagonist) featuring a jumping spin kick to disarm his opponent. The actual scene is actually not intended to be humourous–Code Geass is a military anime, after all, and it relies on similar themes commonly associated with its genre–war, political intrigue, the critique of nationalism, etc.. I personally do not find this image funny. Rather, I find it a curiosity. Why is this image–this exact frame at this exact moment–a meme? There is one seemingly obvious answer–because it’s funny. This is not entirely correct, though. Not everyone finds it funny–humour is subjective. The humour is derived from the absurdity of the intended animation, and the ridiculousness of the exact pose (above screenshot) at this exact frame. What makes it a meme, however, is not the fact that the image itself is “funny”–it is the propagation that resulted from this particular image. In simple terms, a number of anime fans found unintentional humour in this one frame, at the time the episode aired. As a result, the Spinzaku began to circulate, propagating from a single image to a vast number of variations on a single meme, alluding to how widespread the Spinzaku has become.